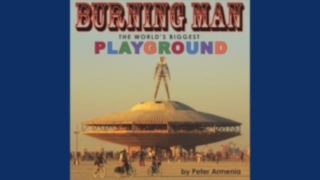 The cover of "Burning Man — The World's Biggest Playground." A photography book for children about Burning Man is seeking pledges on Kickstarter. Peter Armenia hopes to raise $9,000 by Aug. 28 in order to publish "Burning Man — The World's Biggest Playground." As of this writing, 78 backers have pledged $6,259. 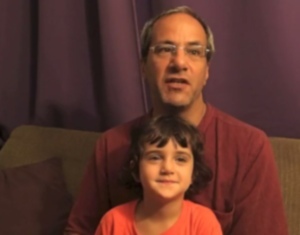 Peter Armenia and his 4-year-old daughter, whom he plans to bring to Burning Man this year. The book's imagery focuses on Burning Man's art projects and cars as well as the colorful people who attend. If funded, Armenia promises he'll donate at least 10 percent of the books to kids and schools in need. The yearly Black Rock Desert event holds a special place in Armenia's heart: He married his wife Gretchen on the playa in 2010. And, after making personalized picture books of Burning Man for his 4-year-old daughter Veronica for the past four years, Armenia is bringing her along this year. Check out the world's first children's book about Burning Man!